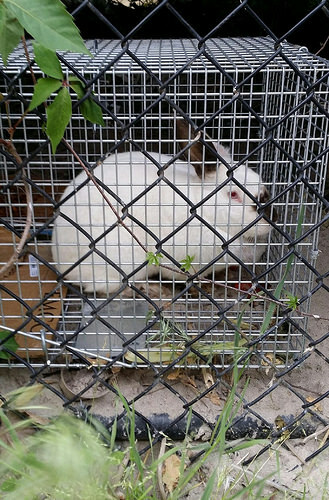 The runaway bunny from the bulldozed Coney Island Community Garden was finally rescued today after 21 days surviving on its own. “Just caught it, here is a bunny ball!” said William Leung in a text message with an accompanying photo at 4pm on Saturday. He named the rabbit Steeplechase, after the famous amusement park. Coney Island was of course named Conyne Eylandt –Rabbit Island– by the Dutch after the wild rabbits that lived here in the 17th century. 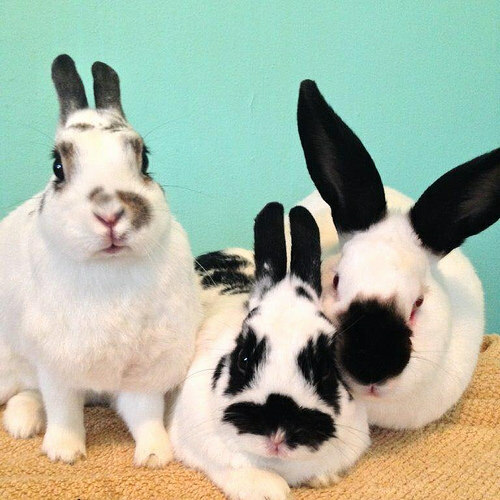 But this white bunny with black ears is a Californian breed of domestic rabbit and has lived her entire life outdoors in the boardwalk garden. “It’s a girl, 7.8 lbs, all those carrots!” Leung said. After the rabbit ran off when the garden was bulldozed by developer iStar on December 28, she was seen intermittently, usually after dark. Leung, a volunteer with Rabbit Rescue and Rehab, the New York City chapter of the House Rabbit Society, has spent the last 10 days trying to catch the elusive bunny with the help of gardener Carolyn McCrory “I’m exhausted,” he said when ATZ phoned on Saturday morning to ask how it was going. 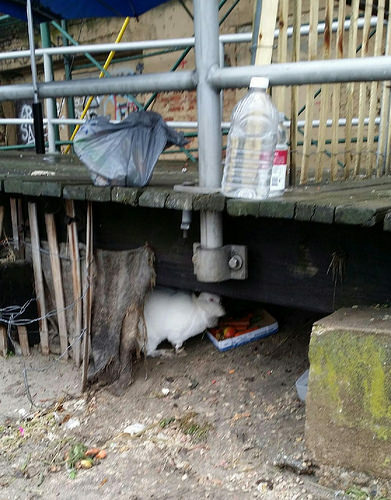 The Queens resident has been traveling once or twice daily from Astoria to Coney Island to leave food, water and shelter in an attempt to befriend and net the rabbit before the bitter cold temps return. 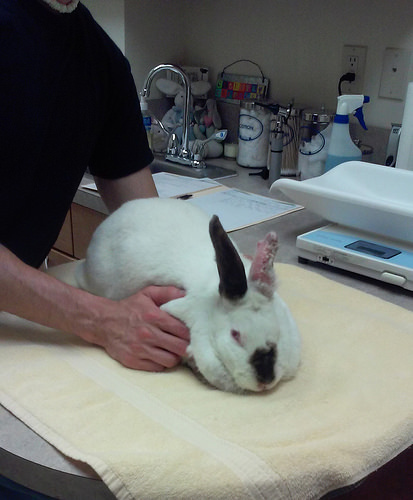 Fellow rabbit owner Mindy Jackson also helped to feed the rabbit during the ten day ordeal. 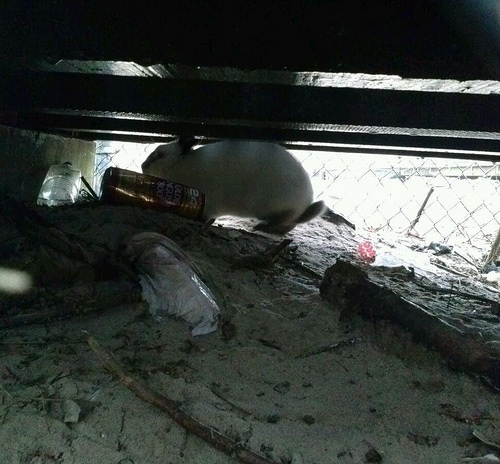 While the banana worked like a charm with another bunny, the Coney Island coney was Leung’s most difficult rescue yet, he says. 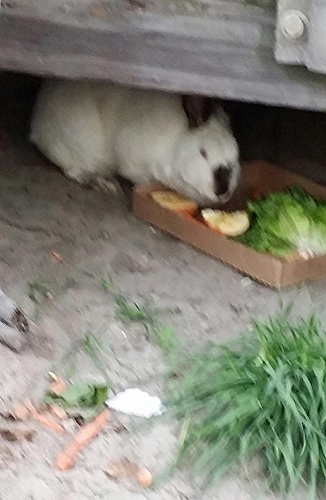 First of all, the rabbit kept returning to its former home in the bulldozed garden but the site managers for amphitheater developer iStar Financial would not allow Leung access to the site, claiming liability issues. 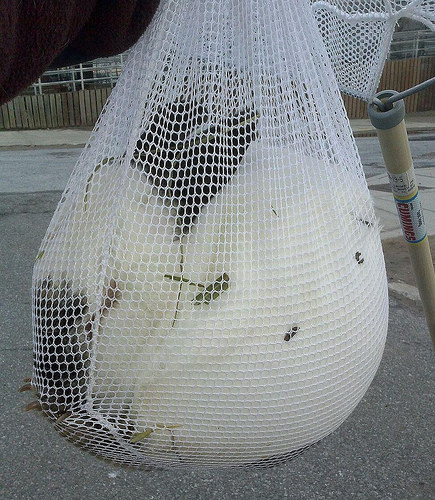 People who came to feed the feral cats inadvertently upset his plan to herd the bunny when they cut holes in the mesh fence for the cats, which the bunny also used to escape. After neighbors harassed him on Thursday, Leung grew increasingly frustrated with the situation, but said he would go out again this weekend. Luckily, he was successful today.